The Vladimir Monomakh submarine will soon leave a naval base in Severodvinsk in northern Russia to join the 25th Submarine Division of the Pacific Fleet based in Russia's Far East. MOSCOW, December 19 (Sputnik) — Russia's third Borey-class nuclear-powered ballistic missile submarine, the Vladimir Monomakh, was officially inducted in the Russian Navy on Friday, the Sevmash shipyard reported. "The ceremony of raising the Russian Navy colors on the Vladimir Monomakh submarine on Friday, December 19, at Sevmash," the shipyard's press-service said in a statement. According to the statement, the submarine will soon leave a naval base in Severodvinsk in northern Russia to join the 25th Submarine Division of the Pacific Fleet based in Russia's Far East. 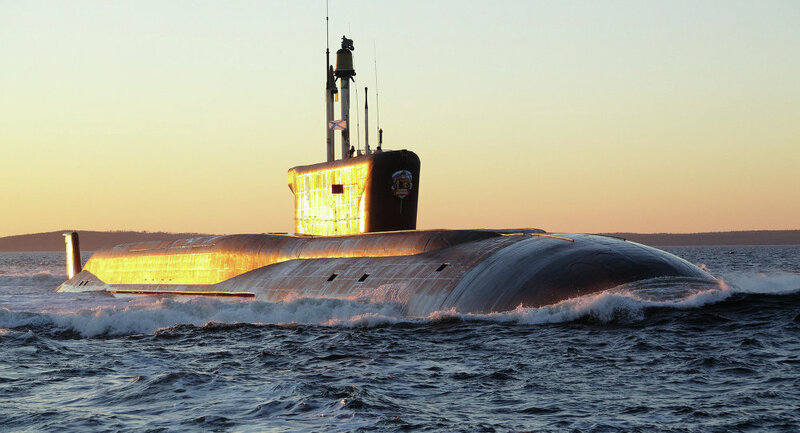 Borey-class submarines are to become the mainstay of the naval component of Russia's strategic nuclear deterrent, replacing the aging Typhoon-class and Delta-class boats. Russia expects a total of eight Borey subs to enter service with the navy by 2020. The first two Borey-class nuclear subs, the Yury Dolgoruky and the Alexander Nevsky, were commissioned in January and December 2013 respectively. The fourth and fifth subs of the class, the Knyaz Vladimir and the Knyaz Oleg, are currently under construction at the Sevmash shipyard. Sevmash confirmed Friday that construction of the sixth Borey-class submarine, the Knyaz Suvorov, will start on December 26.